With the death of Nelson Mandela this week, something has become very obvious: the world values goodness. Isn’t that amazing? You’d think the world values wealth, fame, celebrity, and it does, but it values goodness more. The lesson is simple: to be loved we don’t have to be rich or beautiful, just good. All we need do is to practise the virtues. If that is so, then why is it so hard? Why is it that, when there’s a choice, we opt for the selfish or the self-indulgent? 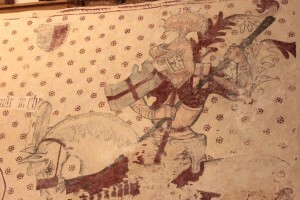 In a church in Wales they are in the process of uncovering – at a rate of one square inch per hour – a fifteenth century wallpainting featuring St George and the Dragon. To the right of him are the Seven Deadly Sins. What does this mean? Where are the Seven Cardinal Virtues? They are usually matched in medieval paintings (see Giotto’s in the Scrovegni Chapel, Padua). It could be that they are yet to be uncovered, but their absence gave me an insight into the nature of them. As we grow up, good is how other people want us to be, so we aren’t. I think that’s because even when small we can detect the fake from the true. Put it this way, there is ego-goodness and then there is the real thing. Ego-goodness is positive goodness, that is, acts done specifically to be good and to please others. I always know when I’ve done one of these – usually giving money to a beggar with a dog – because it tastes like syrup in the mouth, a kind of sticky Tate & Lyle sweetness. Yuk! Bring on Beryl the Peril! What the wallpainting revealed was that virtue is not a thing in itself but is abstinence from vice. When I started this thread of thought on Facebook, a friend pointed out that to be a practitioner of vice is to be vicious and he said that most churches on Sundays are filled with the vicious. Well, most places most days are filled with the vicious. Heck, all I have to do to see one is to look in the mirror. Virtue, then, is what arises when we deny ourselves vice. So, courage for example is overstepping fear, not a thing in itself. Forgiveness is not to exact revenge. These are the things which made Mandela good. And much loved. So why is it so hard? I’m going to try and say no to myself for awhile at least. This is an excellent season to do it, when the pressure is on from all directions to say ‘yes’. ‘Oh, go on, spoil yourself!’ When that little phrase was coined, it never meant ‘give yourself a treat’. To spoil in the OED – ‘to harm the character (of a child) by being too indulgent’. How to be good? By not being bad. 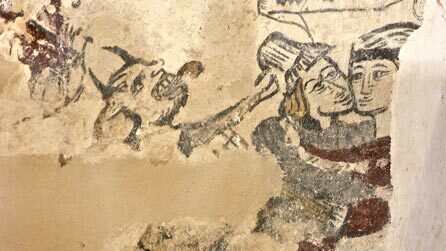 Bring back wallpaintings, I say. This entry was posted in Uncategorized and tagged goodness, Nelson Mandela, Seven Cardinal Virtues, Seven Deadly Sins, St Cadoc's Llancarfan, St George and the Dragon, virtue. Bookmark the permalink. I don’t believe that character is the same as virtue as some have claimed elsewhere. The former doesn’t have to be a virtue since it can exhibit vice. For instance, courage is a virtue whereas both cowardice and rashness are vice. These days you can be decorated for rash conduct where bravery is overlooked and devalued to the point where you can even be called a hero simply for performing your job or dying at work. Gordon of Khartoum is a character just as much as Biggles or James Bond but none not even the real life Gordon could be said to be virtuous. (Gordon was rash, not brave). Nor does virtue mean abstinence, it means having the strength to follow the mean, the middle way between the polarities of each of the vices, so, for instance, bravery is the mean between cowardice and rashness and it is the same with each of the virtues. To be virtuous requires phronesis or practical wisdom (the knowledge of how to behave) and also moral strength (setting aside the desire that might prevent us from being virtuous) such as running away or acting rashly. Mandela is a heroic figure who exhibited all the positive qualities of the virtues including compassion. Many people and politicians will now offer praise and celebrate his life but this is empty and shallow if they do not also emulate those qualities themselves. These qualities may be acquired mimetically, and indeed, this is how humans learn to be human; but in a sick and dysfunctional society it takes great moral courage to emulate such a great man. An ego ideal – to consciously emulate a heroic figure, or even, sadly, a pop star, is a function of ego just as mimesis is a cultural acquisition that leads to the development of a sense of self, but IMHO to intuitively act virtuously can never be faked. Mandela was kept in isolation yet emerged as this great man. What he discovered he found from within himself.